The company whose pipeline ruptured and dumped hundreds of thousands of gallons of oil into a southern Michigan waterway said Tuesday it has offered to buy up to 200 homes in the affected area. Enbridge Inc. Chief Executive Patrick Daniel said the Canadian company will buy homes put up for sale before last month's spill in Calhoun County at their full list prices. It also will buy other homes in the 30-mile-long zone at their appraised values before the spill. Daniel said the idea came from residents' concerns that their homes were losing value, particularly people he spoke with at a public meeting Monday night. The company said it believes the homes have retained their value and the offer, which stands for at least one year, should help keep speculators out. He said he doesn't know how much the offers would cost Enbridge if all homeowners were to accept, but doesn't expect many will sell or the company would lose money. The offer will stand for one year and Enbridge will hold the homes it buys and resell them later, he said. "We're comfortable in being able to handle it, even if they're all taken up," he said. "We're prepared to provide a guarantee to ensure nobody takes advantage of them." Daniel said the company will consider requests from homeowners outside the spill zone individually. The oil flow, reported on July 26, has been stopped and government officials say it's been contained in the stretch of the Kalamazoo river from Marshall westward past Battle Creek. Nearly 2 million gallons of oil and water mixture had been recovered as of Tuesday morning, according to Environmental Protection Agency officials. 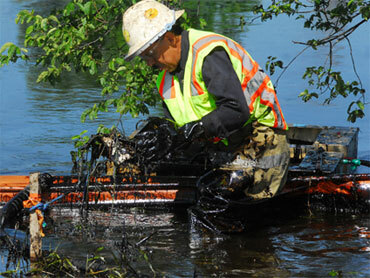 About 700,000 gallons had been shipped to an Enbridge facility in Indiana. Enbridge estimates the spill at about 820,000 gallons, while the EPA previously estimated it was more than 1 million gallons. EPA officials would not provide an estimate on Tuesday. EPA regional administrator Susan Hedman said that Enbridge met a Monday deadline to resubmit its long-range cleanup plan. The agency last week rejected the Calgary, Alberta-based company's plan because of "deficiencies in content and technical details." Hedman said the agency is reviewing the revised plan but could not say when it would be done. U.S. Fish and Wildlife officials say more than 100 oil-covered animals have been recovered from the spill area, including geese, ducks, muskrats and turtles. Several were cleaned and released to wetland areas outside the spill area. The rupture was to a 30-inch pipeline built in 1969 that carries about 8 million gallons of oil daily from Griffith, Ind., to Sarnia, Ontario.